Thank you for posing with my stuffed chipmunk! Ed. 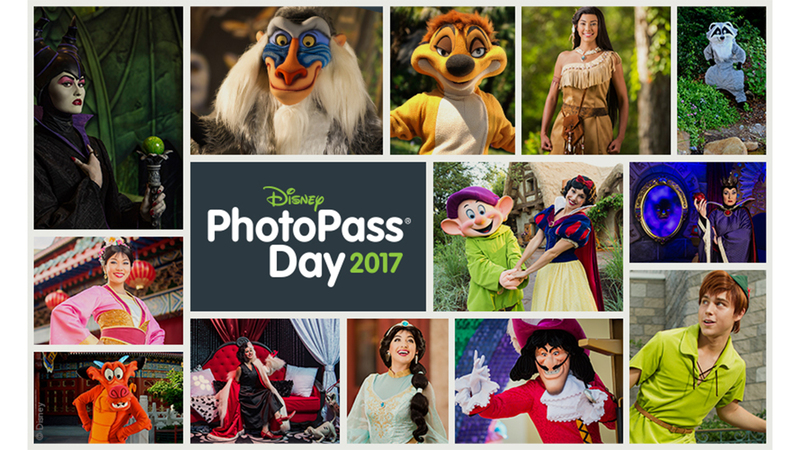 – today we’re running two articles with ideas for silly things that can make your trip to Walt Disney World even more fun. Has your family ever done anything like this? Talk about it in the comments. There once was a Walt Disney World cast member who was selling balloons on Main Street USA. Suddenly a girl comes up to her and asks her if she could take a picture of the cast member holding her stuffed chipmunk, who also happens to be holding a plastic Mickey balloon. The cast member obliges, and the girl walks away with the chipmunk, ready to add more pictures to the chipmunk’s adventure in the Magic Kindgom. Some of you might have very similar experiences as me. Not only do we take family and friends to Walt Disney World, we also take pals to help commemorate the adventure. For some, it’s Flat Stanley. For others, it’s some other special pal. For me, it’s Francine, a stuffed chipmunk. Taking a pal like this to Orlando is a great experience. It allows us to photograph things in different ways, and create adventures for our pals that we couldn’t do with real people. But what is the point of it all? Why bring anything in the first place? Well, first I’ll explain my story. 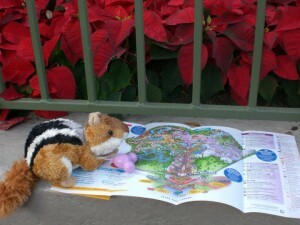 Francine consulting a park map. The story of Floyd and Francine. Way back in 2005, a group of college friends and I took a road trip to Colorado during a fall break. On our tour of Rocky Mountain National Park, we met a cute little chipmunk who was bold enough to approach us as we ate our granola bars. We decided to call him Floyd and make him our unofficial mascot. Eventually, a few of us got married and a few of us stopped teaching full-time, and the Floyd phenomenon died down. But one of my friends decided to get each of us our own stuffed chipmunk (Floyd’s cousins) that we could have in our classrooms all year long, so the kids wouldn’t have to spend months on end without our lovable chipmunk. I decided to call mine Francine, and attached a plastic Mickey balloon to her hand (I believe it was from a Barbie dress-up set) to know that she was mine. Floyd and his cousins not only came into our classrooms, but also went on vacations with us. He has gone to Mexico, Italy, and tons of US states. 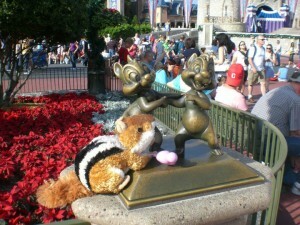 But when I went to Walt Disney World in the fall of 2010, Floyd was in another classroom, so I took Francine instead. As you can see from the pictures, Francine had an exciting day in Magic Kingdom park. She “ate” a Mickey premium ice cream bar, took a ride on the Tomorrowland Transit Authority People Mover, chilled out with Chip and Dale, met Pinocchio, sat on a Main Street park bench, watched cast members make candy apples and pretty jewelry, and decided not to ride the Mad Tea Party. All in all, she had a pretty adventurous day. 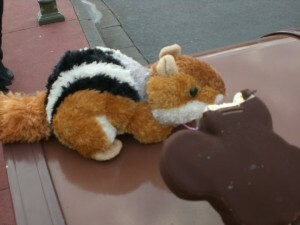 I brought a stuffed chipmunk into the park for a photo blog. I had just been to Walt Disney World in June of that year, and had shared hundreds of pictures with my family and friends. I could have done the same thing in November, but I knew most of my family and friends wouldn’t want to see the same things again. So I brought in Francine and showed the Magic Kingdom from her perspective. Francine hangs out with her own kind! I got a lot of positive comments, and I did a few things I wouldn’t have done otherwise. I wouldn’t have checked out the little statues in the Hub. I wouldn’t have taken a picture at all the signposts of the different lands. The only attraction I rode was the aforementioned People Mover – I spent the afternoon just walking around and relaxing – the first time I had ever done that. Why other people do it. Most people I encounter with a pal in the Disney Parks have a Flat Stanley. Flat Stanley’s book was published 50 years ago, but his traveling adventures were created back in 1995 by Dale Hubert, who found this a good way to encourage pen pal writing in schools. The Flat Stanley would visit another child, and they could have an adventure with Flat Stanley, write it down, and maybe send a picture to the next child. Flat Stanley is still going strong today, though he now has an app and website for posting pictures. 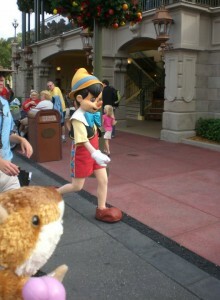 Not only has Flat Stanley been seen in Walt Disney World, but all over the real world! It is a fantastic way to get kids involved in creating a fun adventure. It’s also a great way to get the whole family involved in a fun activity. Always eat the ear first! So many people know of Flat Stanley that when they see another family with him (or one of his cousins, siblings, relatives, friends, etc.) they can’t help but stop and talk to them about the Flat Stanley adventures they’ve had! A bond can be formed from a cute kid on a piece of paper. Disney also has its own version of Flat Stanley in a way. Duffy the Disney Bear was hugely popular in Japan, and was introduced in the United States in 2010. You can go around Epcot and find Duffy in the KidCot Fun Stops in a cute paper form, or you could buy the bear and dress him up in one of the many costumes made specifically for him. Duffy didn’t catch on as much as he did in Japan, but he still does have a group of fans who enjoy his travels! For once, this is not a “people” mover. If you have children or not, I would strongly encourage you to try out a Disney vacation with a pal. Whether it’s a small stuffed animal or doll or action figure from home, Flat Stanley, or some other awesome creation, taking a trip with a pal provides a unique and entertaining experience. It not only is fun for you, but it’s fun for everyone involved. 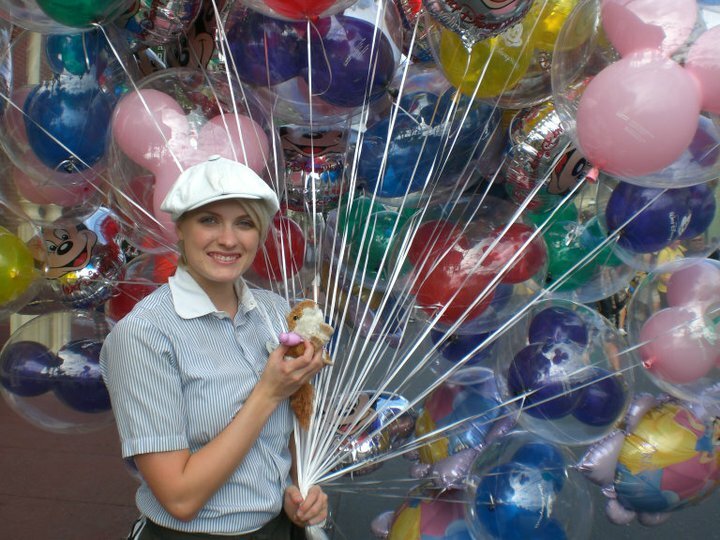 The cast member with the Mickey balloons probably had never been asked to take a picture with a chipmunk holding a tiny Mickey balloon, but it gave her a one-of-a-kind memory, just like it did for me! Have you ever brought Flat Stanley or another pal into the Disney Parks? What experience did you have that you might not have had without your pal? Please comment below and share your adventures! We did the same thing this trip (sort of)! We bought a tiny little lotso hugs plush and a stitch and had them have many adventures around the parks. They have magnets in their hands so they can clasp onto stuff. Got some pretty cool shots of them (hanging of lanterns in China at Epcot, hiding in planters at MK, drinking lapu lapu at ‘Ohana ect). Magnets in the hands?! Awesome! That takes this kind of trip on a whole other level because of all the stuff they can hold or hang on. Fantastic! I’m assuming that this shark was a plush or taxidermied, but honestly I can’t be sure that it wasn’t alive… 🙂 My favorite picture is the one with Francince with Chip and Dale, because putting something that could actually fit in that area of the park (like Steve in The Seas) makes it better! I love it when puns become a big inside joke. Thanks for sharing it with us! I love this post. The Spare Bear (that’s his name) normally just stays in the hotel but this year he’s having his own day in the park and I’m very excited! 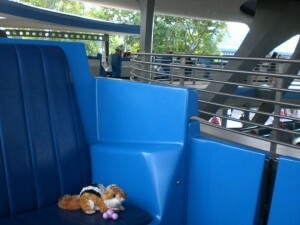 The Spare will be riding Splash Mountain, meeting Winnie the Pooh and – like Franchine – travelling on the people smoocher. Francine is a big fan of the quiet rides. I don’t think she’d go on Splash Mountain like Spare Bear does – way to go Spare Bear! Your students must have loved Floyd and Francine! When I went to Hawaii I took my nephew’s Lightning McQueen. Every day I sent him a picture of Lightning’s newest adventures – including a helicopter ride, parasailing, and chilling on the beach. My nephew is now planning to bring him on our next Disney trip. I forgot to mention how you can communicate with people in other places using their toys or other items – thanks for mentioning that! This made me laugh out loud – what a great story! Thanks for sharing! Thanks for the great idea Claire ! My kids will love doing this on our next trip and sharing all the photos with their friends. You’re very welcome – have a great trip!